Today I'm reviewing Winchester's target ammo. 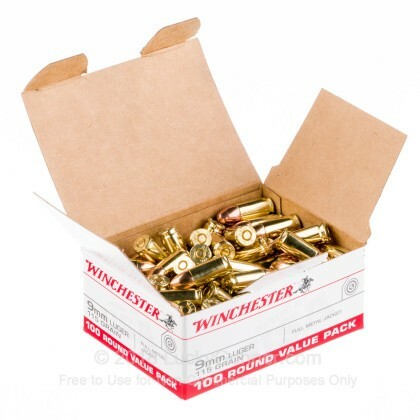 Officially called "the USA brand," most people just refer to it as "Winchester White Box." This is their vanilla target and practice ammo that, according to Winchester, "offers great performance at a value price." We ran some 9mm for this test, the Winchester 115 grain. It's got a reloadable brass case and an ordinary lead-core bullet with a copper full-metal jacket. 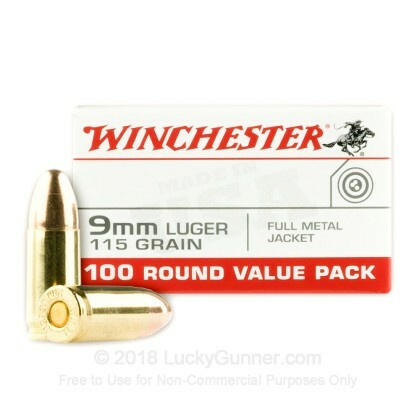 The 9mm Winchester target ammo comes in this 100-round box. And the rounds aren't stacked in trays or anything, they're just kind of tossed in there. I actually sort of like it, because when you open up the box it's like, holy crap, there's so much ammo in here. I can just shoot and shoot and shoot all day long. But then you run out. And that's OK, because this ammo is really not very expensive. 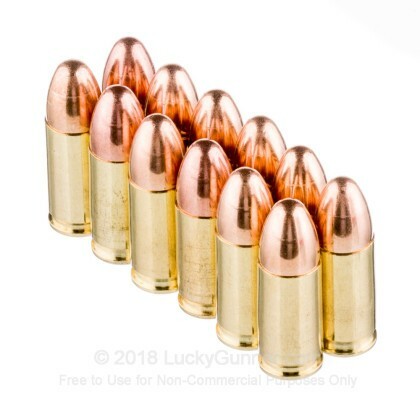 I've probably shot more 9mm Winchester White Box than any other center-fire ammo, and it usually works just fine for me. I won't say that I've never had a malfunction with it, but in the several thousand rounds I've been through the problems have been few and far between. For this review the ammo ran just fine in all of our test guns. Accuracy was pretty good and about on par with most of the other nine-millimeter practice ammo that we've reviewed. Our 10-shot group from the bench was done with a Glock 19, since that's typical of the kind of gun most people are going to use with this ammo. But we also had a Beretta 9mm carbine at the range with us, so just for kicks we shot that from the bench. And we got that tiny little group up in the left-hand corner there. So if your gun is accurate and you do your part, the Winchester ammo should perform. 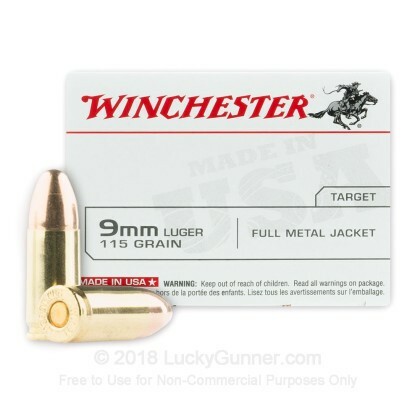 Overall, Winchester White Box is great for the range, especially for reloadable brass-case ammo made in the US. Great price and function well. I have shot over 3000 rounds with only one malfunction. Very good range range Ammo! This has become my standard training ammo. It isn’t fancy, but it works every time...in every pistol I put it in. Not saying problems aren’t possible, but I have yet to see this cause any malfunctions. Great Range Ammo. No failures in G19 Gen 5. Thinking that Winchester’s name being on the box that this selection of ammo would be good to take to the range. Was highly disappointed in the performance. Tried shooting from a Glock 17, Walter CCP, and a Tanfoglio TA-90. Could shoot one to three rounds in each of the guns named and I would get stovepiping or mid fire. Would not recommend this ammo! I just purchased my second 1,000 rounds of this ammo. However, when I first bought my gun (I am a newbie), I had a problem on the third round ever fired... it fired and STAYED IN THE BARREL! It literally went 1 inch after the bang. I honestly think it was my fault as I was so new to loading and racking... the bullet was dented in its rear and got stuck in the barrel. Once cleared, all of the other rounds were perfect. I must have pinched it real good when I loaded and racked. Since then, I've shot box after box with zeroissues. Always goes bang (and then hopefully ding!). Good price, especially for brass. Don't consider the steel case ammo. Go for Winchester brass. I've used the 115 grain FMJ and the JHP in my Glock pistols and I've never used anything else. They're cheap and reliable. That's all you need. Well all I can say is when I buy factory ammo I buy it for 1 reason to go bang ever time you pull the trigger. These came in boxes of 100 and every box did seem to have an extra round in it so boxes of 101? I wondered why 101, hummm.... Went to the range (I normally shoot 300 rounds when I go) and started shooting these rounds. I shoot bill drills, so I go through 100 round pretty quickly. All went well for the first 20 or so rounds and then click - no bang??? Factory rounds should always go bang, I could see possibly a reload not going bang, but not a factory round. I tried reloading the failed round and tried a second time, no bang... Long story short out of 300 rounds I have 7 failures to fire. DO NOT BUY THIS AMMO FOR SELF DEFENSE!!! Would not be wise to be expecting a bang and only get a click! Shame on you Winchester! Bought 1000 rounds and so far had 3 misfires in the first two hundred, two in my Springfield XD and one in my Glock 43. Never had an issue with either one. I won't be buying these again. In my P226, I had 4 FTE out of 100 rounds. Had never had an issue with any other ammo, including white box before. After the range trip, cleaning the gun I found it very dirty. Not sure if I just got a bad box, but I will be holding off on getting anymore white box for awhile, hopefully they will get their quality control back on track soon. It is well priced, and Lucky Gunner was great! Not the worst but not ordering again. Saw another review where a gent had FTF/FTE issues with a G19. I did too. Every 100 rounds - at least - I had an issue, 50 / 50 on FTF or FTE. Yep, could see the primer strike on the round. Tried firing a couple a second time with it working a few times. I get this is Win's cheap ammo but its dirty and the FTF/FTE issues gave me a bad taste. Not gonna buy again. On the flip side, Lucky Gunner continues to be awesome every time. Good range rounds, although a bit more residue than some. I went to the range Monday and had no problems with any of the rounds shot off - no misfeeds or misfires. I am planning on trying out a few different brands though to compare as this was the first ammo I've bought. Shot these at the range -about 100 rounds through each pistol. Overall it is dirtier than most other brands - I expected better. No misfeeds in the Sigs or Glock, but misfeed in the Ruger, probably from the residue build up. All pistols took some extra cleaning. This is the first time I used this ammo. Purchased 1000 Rounds. This is the first time I have had a problem with ammo purchased. I used it in my Wilson Combat AR9 and Glock 19. Some rounds didn't fire at all and some had problems ejecting. I personally would not purchase this ammo again. I bought 2000 rounds of this ammo. 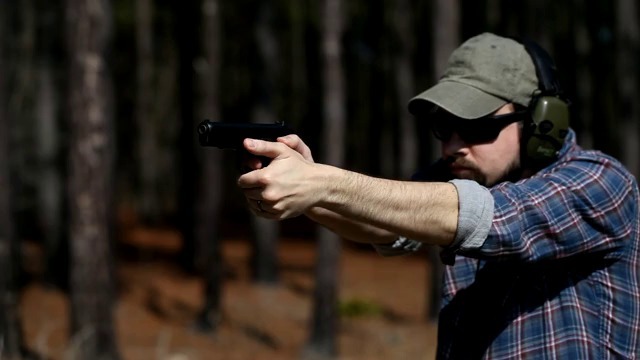 put my XD, Glock 19, and Sig 2022 to the test. The day the ammo arrived I went through all 2000 rounds in one session. Sig without a doubt performed great, but there was one time the bullet got stuck on the slide as it was ejected. XD hands out took like a champ without any problems. Glock 19 brand new and my carry weapon on the other hand, surprised me. The firing pin hit the primer of the bullet and it didn't fire. There is a visible indent on the primer and still no fire. That happen to about everything time on every new set set. I wasted about 50+ rounds just on that alone. Every 1000 or so rounds I do a complete clean with all my guns. I only shot about 600+ with all 3 of my guns. Will I ordered again probably so. Next time just us it on my XD only and see if the issue is just with the Glock. Overall I would recommend this product. And I did buy this product when it was on sale. Bought this for general target practice at the club I belong to. While generally speaking the accuracy is consistent out of my Beretta 92FS, through the first 200 rounds, the round failed to fully rack the slide. While I didn't have any misfeeds, a number of times the slide closed on an empty magazine. Have never had this problem with thousands of other rounds through the gun, nor contemporaneously when feeding a premium round, such as Hornady Critical Defense. 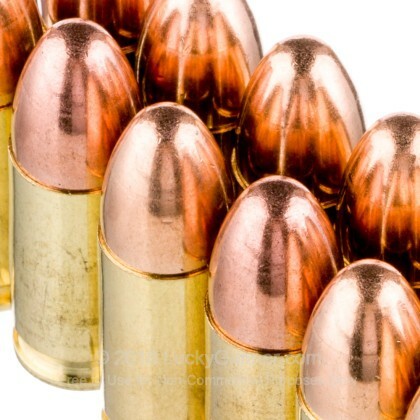 Great ammo, zero misfires or jams. My Beretta loves it. This was the second batch I have purchased and will do so again soon. Thank you Lucky Gunner. My order required documentation to my home state to allow for shipping and delivery. Lucky Gunner handled it all, and delivered as promised. See you on the next one, Angela & Chris! Very happy with my purchase. GREAT PRICE!! GREAT SERVICE!!!!. Thank you. Bought a 1000 rounds of Winchester Ammo, for my GLOCK 19 GEN 4. to take to the range. Shoots great. No problems. No jams. Nice and clean.I'll be doing my shopping just here. I bought a 1,000 rounds and shot the first 200 rounds using my Glock 19. Went flawlessly in all aspects. I highly recommend this ammunition with the Glock. As usual, delivery was fast and the price the best around. I appreciated that I could get an "overbox" at no extra charge. Yes, the was some damage to the outside box, but minimal to the factory carton. I do not believe the delivery folks are expecting such small packages to be a bit heavy! Thanks again. Good price and quick shipping . I will definitely order through Lucky Gunner again. I loved the product, but thought I was buying ammo that could be used at an indoor range. They (at the range) said I could only use the WinClean ammo... Not sure what the difference is? Every round performs well. Leaves less residue than others. Fast processing and delivery. 500 rounds fired so far thru my CZ P07. As soon as I burn through this 1000 I will be ordering more!!!! After 50 rounds the gun is very little dirty, compared to the ammo I buy at the range. And I got a little surprice in each box. One extra bullet, nice :-) That adds up to 20 extra bullet for my order on 1000. Price was reasonable. Quality fine. Does not leave any particulates inside of my gun (Ruger LC9). on the slide. When I run down, I will order more. 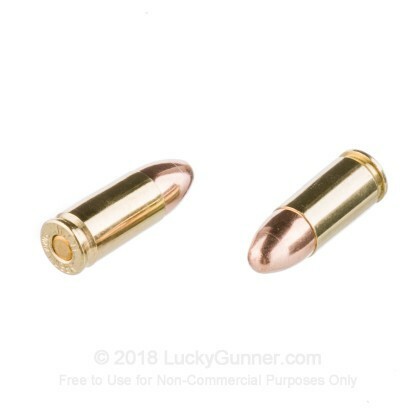 I use this ammo in my bullseye setup gun and it works real well but it does not work as well in some of my other guns for different types of matches. This ammo works just fine. 1000 rounds for my ruger sr9c. Shoots great. Good price. Quick shipping. Reliable WWB - good price, shipped fast! Winchester White Box is a reliable standard for ball ammo - you can't go wrong. Lucky Gunner processes the order and ships FAST! I have put about 1500 rounds thru my Glock 19 without a single failure. The product is very consistent in performance. I just pruchased another case. Have found 2 (out of a thousand) with deformed casings. Shipment must have been dropped by shipper. Thank goodness the shells were stored in the ammo case I also ordered. Solid 9mm round. Super Service from L.G. No problem whatsoever in my new CZ SP-01. No extra residue after shooting. Note that these are loose in the box. I prefer the more orderly arrangement of the extra "egg crate" packaging. A minor consideration given the solid performance and value of this round. Excellent bulk buy. Fired over 1000 rds. on my Glock, XDM, PK30 no miss fire. Love the product and the service. Incredible turn around time. I had previously made countless orders from other websites only receive back ordered notifications weeks later. Then I found your site. Thank you for maintaining an actual real time inventory system, and for providing excellent custome service. You have earned my loyality. Good price fast shipping and quality product. will order again fo sure. shot 400 out of 1000. no problem so far. Im placing another order today. Great ammo-no problems at all and the delivery was awesome. Ordered on tuesday and i was in the range on friday. i will definitely will be back here for more!!! !